Like the adored sweet onion that gives this Boone restaurant its name, Vidalia embodies a depth of layers, taking diners from cuisine that is soulful (chicken and waffles with sawmill gravy) to haute (sesame coriander tuna). Husband and wife team Sam and Alyce Ratchford took over the restaurant in 2008, keeping mainstays on the menu while expanding the eatery’s culinary horizons. It makes for a menu that cleverly caters to a variety of crowds, from Appalachian State students to couples out for a sophisticated dinner date. The truffle fries topped with shaved Parmesan and towers of onion rings, both served with spicy Creole fry sauce, are the favored starters that arrive at nearly every table. I am compelled to sample one ring, which is almost meaty thanks to the Cajun-seasoned ale batter that is more bready than crispy. Following the comfort food theme, the logical next choices are the mac and cheese with a pork cracklin’ crust, smoked chicken ’n’ dumplings, or applewood bacon-wrapped meatloaf. But peel back another layer—beyond rib-stickin’, amped-up Southern specialties—and Chef Sam’s broader influences come to the fore in dishes like the house-made mozzarella ravioli with tomato pomodoro sauce and the toasted sesame and cracked coriander seed-encrusted ahi tuna with Sriracha aioli and chili-ginger slaw. 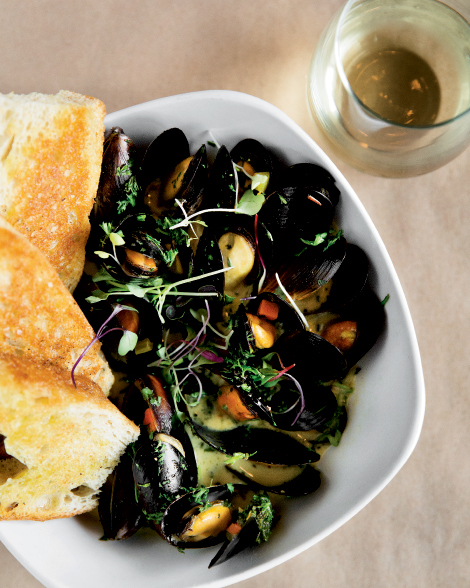 The Billi Bi mussels are steamed in white wine and served in a golden saffron cream sauce with a perfect mirepoix base of crisp celery, tiny bits of carrot, and diced onions. The saffron imparts a depth of bittersweet, faintly floral minerally essence. A generous helping of toasted focaccia is served on the side for dunking. The chef’s delicate treatment of this meaty white fish reflects his finesse. A tomato and olive oil pan sauce is light, bright, and balanced against the rich protein, and the accompanying twice-baked fingerling potatoes have a slightly caramelized skin. Microgreens tossed with fennel vinaigrette atop the fish are a fragrant and subtle touch. Tender asparagus spears and al dente haricots verts round out a sublime dish. For dessert, fig bread pudding and a flight of house-made ice cream offer the final contrast in a menu that proves refined and casual cuisine can join forces to satisfy diverse tastes under one roof.